Until the mitochondria, not particularly stained, are not easily visible under the microscope. The number of mitochondria per cell is variable depending on the physiological activity of the cells. In the case of shape and size also, a considerable degree of variation is observed. Generally, this sausage is shaped or cylindrical in which the diameter is 0.2-1.0µm (average 0.5µm) and length 1.0-4.1µm. 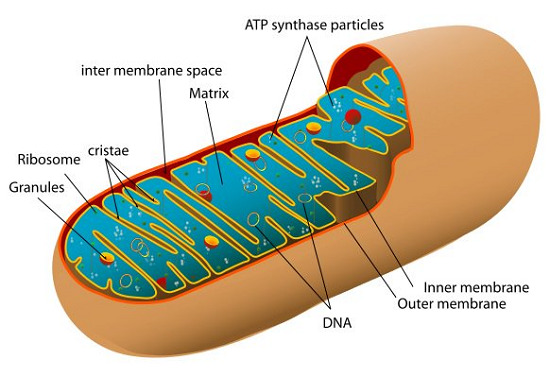 Each mitochondrial is a double membrane-bound structure with the outer membrane and the internal membrane, which divides its lumen into two aqueous compartments. i.e., external compartment and interior compartment. The internal compartment is called the matrix. The outer membrane forms the continuous limiting boundary of the organelle. The inner membrane makes several infoldings which are called the cristae towards the matrix. The cristae increase the surface area. The two membranes contain their specific enzymes associated with the mitochondrial function. Mitochondria are sites of aerobic respiration. They produce cellular energy as ATP, so they are called 'powerhouses' of the cell. The matrix also possesses a single circular DNA molecule, the components required for the synthesis of proteins and a few RNA molecules. The mitochondria divide by fission.